To cater to the online shopping needs of people, the Best Free Open Cart Templates have been designed and developed. The offering of templates is remarkable for the online enterprise because they simply need to get installed once and then beyond it, it is just a breeze to handle.You may also like Free Magento Themes. The free responsive movie store open cart theme is a dark themed open cart template that uses big thumbnail pictures to advertise the movies on sale by the movie store. The free responsive fashion shop open cart template is a well-structured and beautiful looking open cart theme template that can be used by the online fashion stores to advertise the products. The free online electronic store open cart theme is an elegant open cart theme template that can be used by the electronic stores to boost sales and increase revenue. Clean Lean template is crafted for online stores selling gym accessories. It is compatible with all major browsers. It comes in a white background. One can create one’s own account here. The home page of this template features a banner. This theme comes in a white background. 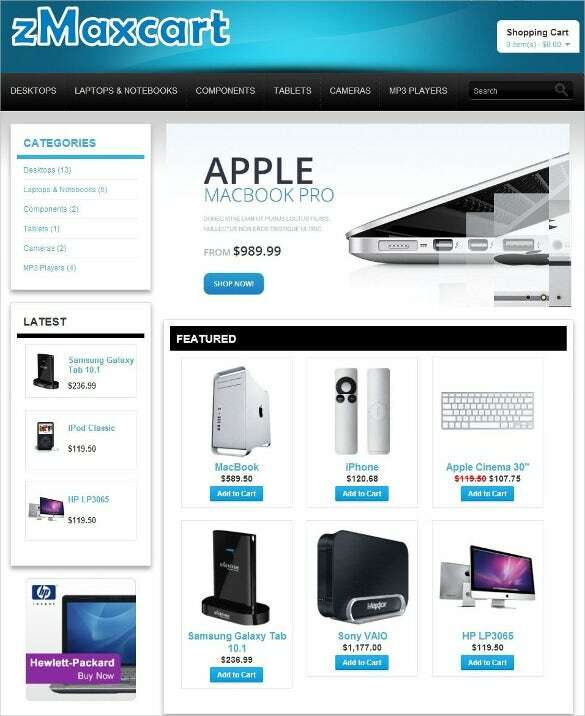 It is designed for online stores selling electronic gadgets. It comes in English language only. All products are sold using multiple currencies. It has search options. One can create an account and one’s own wish lists. It provides contact information and site map. There are wide varieties of Open Cart themes to choose from; not only are all of them suitable for online enterprises but their top features include easy utility, customizability and search engine optimization so that the website would invariably rank among the top most. The designs are generally clean and neat with multipurpose interfaces which could be personalized further. There is extensive documentation available with them which along with the installation guide makes them easy to use without any prior knowledge of coding. The best part about these templates is that they are responsive making them functional in all kinds of devices. Avail them for free to begin with and when you have the hang of it, you could upgrade yourself to a premium payable one.So, give your clients a great online shopping experience through such templates which would enthrall them and make them come back for more. The above themes and templates can easily be installed. These are suitable for business websites. These are designed to give them a professional look. They can be customized easily. Sliders showcase images in vibrant colors. They also provide site map and other contact information.